The second edition is available now! Now available – click to purchase! The Aether’s Edge series is a pentalogy of Sci-Fi/Fantasy novels for young adults and up. The stories empower girls to follow their dreams and make the most of the world around them. In Greek Mythology, the word Aether describes a substance believed to occupy the universe beyond the worldly sphere. It is the rarified air, breathed only by the gods, and it happens to be the perfect medium for levitating a mystical airship. The book is now available in both paperback and hardcover, with personalization by author Cheryl Ammeter. Ready to enter the world of Aether? Take the leap into Ivey and the Airship in the Aether’s Edge Shop! – Jane Howle, former publisher of Baskerville Publishers, Inc. The often invisible, ferocious ‘waterdog’ is a boffo creation. I want my own. 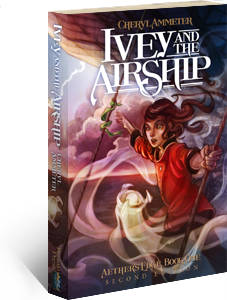 Ivey and the Airship really has everything: adventure, romance, humor, large metaphors . . . and I loved the ending! — Jane Howle, former publisher at Baskerville Publishers, Inc. I want my own. Ivey and the Airship really has everything: adventure, romance, humor, large metaphors . . . and I loved the ending! — Jane Howle, former publisher at Baskerville Publishers, Inc. The book spirals in and out of Inception-like dream circles. Ivey and the Airship is definitely a book I would recommend to any reader of steampunk or adventure novels. Just provide your name and email address, and we'll send you discreet messages — perhaps even warnings — about all things Aether!